I don’t know about you, but I don’t use a lot of poultry seasoning – I may add just a smidge to a dish now and then throughout the year, but I always use it in my Classic Midwestern Thanksgiving Stuffing. Two teaspoons, every year. I really don’t want to buy a whole container and have it sit, taking up room in my spice cupboard. So I did a bit of investigating and came up with this post on Poultry Seasoning – Make Your Own. So when I wanted to mix up some Poultry Seasoning, I turned to the net and was quickly overcome with all the options. It’s a serious business this (yep, all this for two teaspoons!) because I want a specific flavor to my stuffing – the same one I’ve had over and over for decades. While a little deviance from my recipe might be a good thing, it won’t be the same thing, and the herbs & spices in poultry seasoning are strong enough to skew any recipe, even used in small amounts. I thought I’d share what I’ve learned so everyone can pick and choose for a homemade blend. You can go with a classic or have the options to sally forth and create a “house” blend. Write it down, so your kids don’t ever have to hear, “Good stuffing; almost as good as Mom’s” or “It’s almost right, but something’s missing!” And believe me, they’ll be hearing that long after you’re gone if your family is into sharing and cherishing family recipes. As a matter of fact, if you read about the history of poultry seasoning, below, you’ll find that even the long-standing old recipes for poultry seasoning have been changed over the years. Making your own is one way to make sure you’ll always have the exact flavor you want. And make your own poultry seasoning so you can have the freshest tasting poultry seasoning every year, without the added expense of buying a new package when the holidays roll around. It’s likely you have most of the spices already in your pantry if you do much cooking at all. If the recipes are more than you’d like to make, just scale them down. For years, poultry seasoning followed a pretty standard formula, one that appeared in very early cookbooks and should be pretty familiar to those who favor Schilling. Not surprisingly, early records of Poultry Seasoning seems to be tied to the Baltimore area, an area home to some of the earliest published cookbook authors. Ingredients: rubbed sage, marjoram, thyme, nutmeg, and black pepper. Then an upstart appeared: Bell’s. According to their website, “In 1867, William G. Bell, a Boston inventor, and cook created Bell’s Seasoning. A unique combination of rosemary, oregano, sage, ginger, and marjoram – today’s blend is unchanged from the original recipe.” Isn’t it nice some things, at least, always remain the same! Around the midpoint of the last century, the Schilling canisters indicated they were tied to McCormick’s, and McCormick’s current list of ingredients states: thyme, sage, marjoram, rosemary, black pepper, and nutmeg. The three classic Poultry Seasonings, above, are all pretty similar with the exceptions of rosemary, oregano & pepper, which appear only in some and a swap out of nutmeg & ginger in others. The proportions differ, though, in the main ingredients from one to another. Many spice companies produce their own house blend. Penzey’s, for instance, describes theirs as a “Sage-rich Southern blend” and lists their ingredients: hand-mixed from sage, white pepper, bell peppers, lemon peel, savory, rosemary, dill weed, allspice, thyme, marjoram, and ginger. To further complicate things, many of the big cooking websites, those from television networks, cookbooks, cooking magazines and sites composed of consortiums of chefs whip up their own blends and versions. Some of these include more herbs and spices in addition to or instead of the ones above: celery seed, dried onion, garlic, clove, cayenne, coriander & parsley, just to name a few. Note: all the photos for the spice boxes come from ebay. 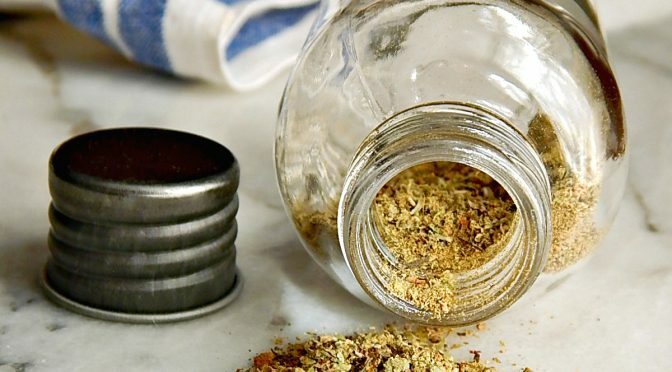 Place marjoram & thyme in a mortar & pestle (or spice grinder) and lightly process until powdered. Add remaining ingredients. Mix together and grind to fine powder in a coffee or spice grinder. Makes about 1/2-cup. Measure thyme, sage, marjoram & rosemary to a spice grinder. Process to a medium grind. Add pepper & nutmeg, blend 5 more seconds. Use 1/2 to 2 tsp. to 4 cups bread cubes for stuffing for poultry, veal, lamb, burgers or pork. Add to chicken, turkey, game birds and other meats as a rub. Add to stuffings & dressings, casseroles, barbecue sauce, meatloaf and herbed breads. Works well with many chicken dishes, including chicken stews, fricassees, soups, chicken & dumplings, pot pie. Flavors chicken soup as well as other soups, including vegetable. This entry was posted in Click here for Fabulous Food Posts and tagged Spice & Herb Blends. Bookmark the permalink. Mcormick’s had allspice in it. If I can believe my mom’s late 1950’s can. I love this! Can I reblog it?? I love DIY spice blends! I’m so gad you commented because I wouldn’t have thought in a million years to try it on tofu or seitan! And I do eat tofu now & then! yes, yes! I am an omnivore but my hubby & I do eat vegan5x/week & once fish & once meat! So of course, I’m curious! What did you put in yours? I used it to make a batch of country gravy for pork chops and used sage, thyme, summer savoury in place of marjoram which I didn’t have, rosemary, nutmeg and black pepper like the McCormick’s copycat recipe. For proportions go to the post. Num! I don’t often use savoury and every time I do, I’m surprised by it’s flavor! I bet this was delish!